The Chinese stock market suffered another punishing day Tuesday, prompting the country's central bank to cut interest rates hours after markets closed. The government also lowered the amount of cash banks are required to set aside in reserves. 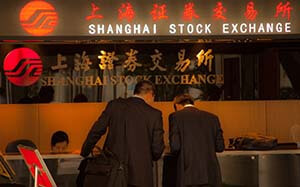 The Shanghai Composite Index ended Tuesday with a 7.6% decline. The index closed at 2,964.97, sinking below the 3,000 level for the first time since December. In the four days since Aug. 19, China's main stock benchmark has fallen 22%. The smaller Shenzhen market tumbled 7.1% Tuesday. More than 700 stocks fell by the 10% daily limit in Shanghai today. Tuesday's rout followed an 8.5% decline in Chinese stocks on Monday. That marked the worst one-day loss in more than eight years. The tightly regulated Chinese government media didn't hold back, describing the dismal day for Chinese investors as "Black Monday." One-month losses for the Shanghai and Shenzhen now sit at 27.17% and 24.17%, respectively. The Shanghai index is down 45% from its mid-June peak, while the Shenzhen is down 47%. At their apex, Chinese stocks were up 60% for the year. Shares in China had soared 150% from June 2014 to June 2015. The run was fueled by individual investors who often borrowed heavily to start investing.